We came up with ‘ValYou’ as we realised that we all had a mutual passion to mitigate the gaps that traditional education currently has. That is, in today’s fast paced society, the range of skills required are far beyond the skills we acquire from traditional learning. This also leads to mental health challenges caused by young people disengaging from education and feeling under-qualified/un-valuable. We were inspired to break this negative cycle by reengaging individuals through short, interactive educational courses. ValYou is an online platform that helps young people to reengage with learning through micro-courses to increase their feelings of self-worth and improve their quality of life. 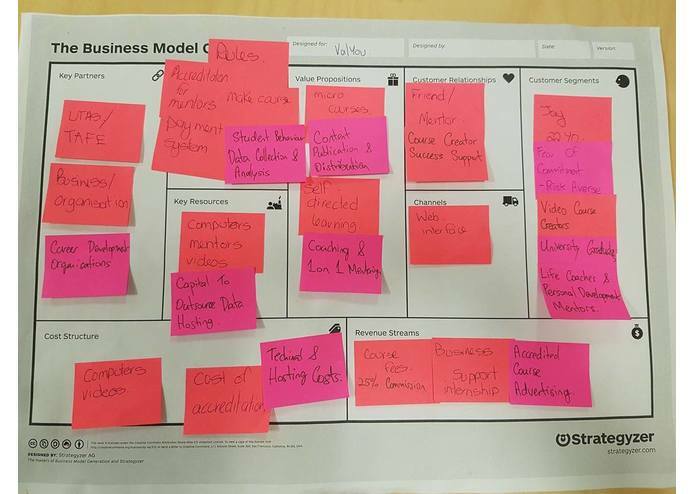 Using a marketplace model, we provide the user with access to a wide range of micro-courses which are educational courses of no longer than 60 minutes in length, with a maximum of 5 minutes per chapter. These courses are provided by individual subject matter experts through our web application and serve to re-engage learners by enabling them to learn new topics, with minimal emotional, time or financial investment. There is a reduction in emotional costs due to an increased perception of fun and simplicity through the ‘micro-learning’ concept. This allows us to re-engage otherwise disheartened learners through the perception of ‘learning made easy’. How Does The Application Layout Work? The core application has two elements to it, the student learning and course publication elements. 1- Suggested Courses (Scrolling Carousel on top of application) Using previous course history, ValYou automatically suggests new micro-course options which allows the student to gradually gain subject-specific knowledge while mitigating the risks and fears that come with larger courses. 2- New Courses A list of new courses that have been released on the app in chronological order. 3- Popular Courses A list of popular courses, based on the number of recent student enrolments. 5- My Courses A selection of course enrolments which includes current and previously completed courses to allow user to easily view past achievements and promotes a sense of accomplishment. The key design ideology behind the application was to ensure very minimal intertia by ensuring that the application was user friendly, had fast loading times and was immersive. This is accomplished by providing uses with immediate access to available courses, with no additional input required by the user beyond login, to promote user engagement and increase course registration rates. Each chapter of a course also provides the user with information regarding chapter length to further emphasise how short, simply & easy each course will be. 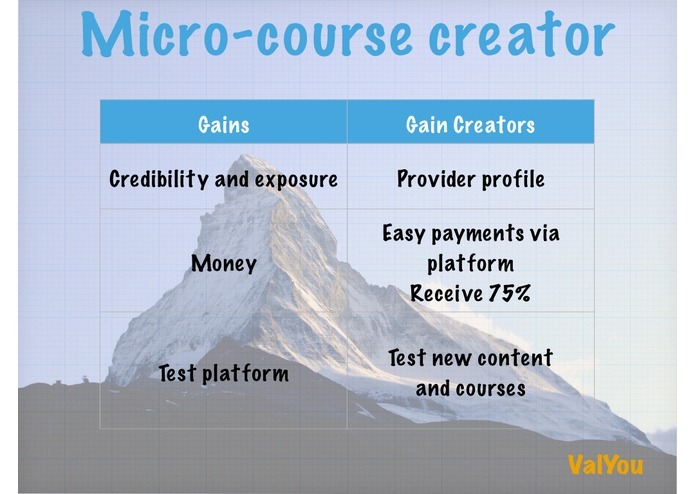 At the end of each course, course creators are able to upsell other larger, paid courses to a student. These larger courses will be hosted natively on the ValYou platform and provide a new revenue stream for course creators. 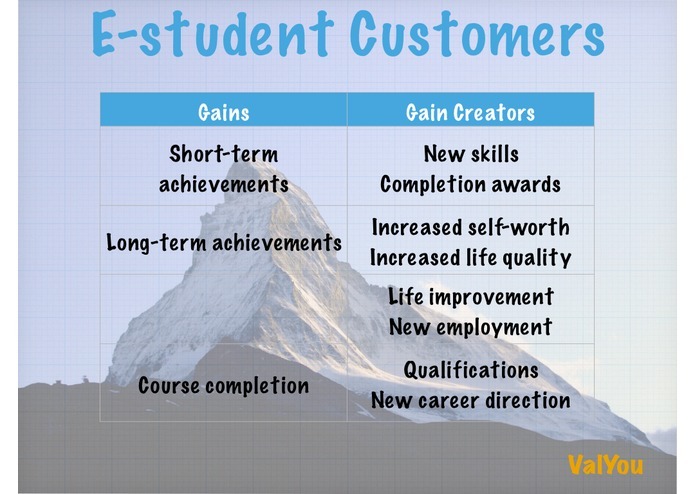 It allows course creators to easily target a new market of students who previously, would have much higher customer acquisition costs as they were hesitant to invest in larger courses. 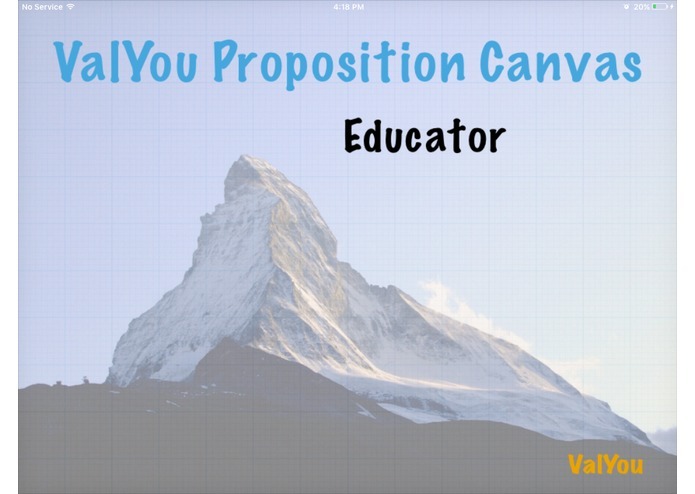 ValYou takes a 25% facilitator fee from any courses sold through the application. We built our mobile application using React-Js which is a great library for prototyping quickly, by the second day we had a functioning app that we took to the street to gather user feedback. React is almost the same as react-native, which means would could easily port our code base to a native platform if need be. We made it a single page app, so there’s no page refreshes, even though the web is our platform our app has a native feel, this is where the future seems to be heading. We’ve written our code using newer language features (ES2015, ES7) to take advantage of better syntax and to keep our code base clean and we’ve been transpiling this using babel before generating our client assets as browsers don’t widely support these features yet. For the backend we used node.js, this means we can run the same code on both the client and server to create an isomorphic app, i.e. we render the html on both the client and the server. This means we get the best of both worlds, a truly dynamic single page app but also the responsiveness of static html loading very quickly. We used webpack to bundle and minify all our client assets into small chunks to load so the user never has to download more than necessary. A key issue we dealt with was alignment and clarity. As we were a group of 5 individuals who had never worked together before, it was initially a challenge to align all of our ideas and collaborate as one uniform team. Through open-communication, we were able to align all of our ideas and passions to come up with a final product that met each of our goals. Next, as we were all passionate about mental health, it was challenging to decide which problem we wanted to tackle. That is, clinical mental health or general mental health and wellbeing. We decided to focus on our ability to have a long-standing impact on society and as such, choose to help those with general mental health and learning difficulties. This also lead to issues with time-management as we had to cut out many core feature elements from our application as we only had a limited amount of time. We decided to focus on the front end, student user-interface to showcase the potential of the application and follow this, we can build and expand the marketplace elements post UHack. Our biggest accomplishment is the formulation of our target market and a finalised business model within the first afternoon. We were able to accomplish this and breakthrough the barriers we initially faced by emphasising open lines of communication and leveraging our individual strengths and passions. Firstly, we learnt the importance of identifying a pain point. 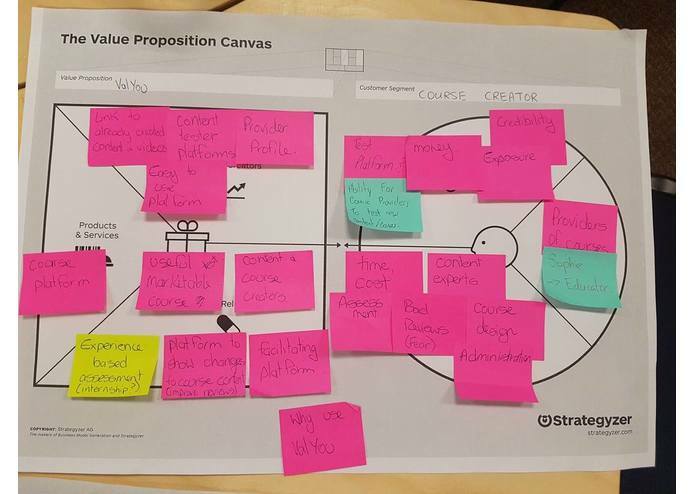 Instead of finalising an application and then identifying an audience that would find value in it, we leveraged the concepts we all have learnt from the Lean Startup. We mutually agreed that in order to have the biggest impact on society with our app, we first needed to help just one person. That one person was Jay. Jay was our initial consumer profile. A young male, struggling with low self-esteem and mental health difficulties due to a lack of employment opportunities post university, we focused on developing ValYou’s feature set to meet his needs. 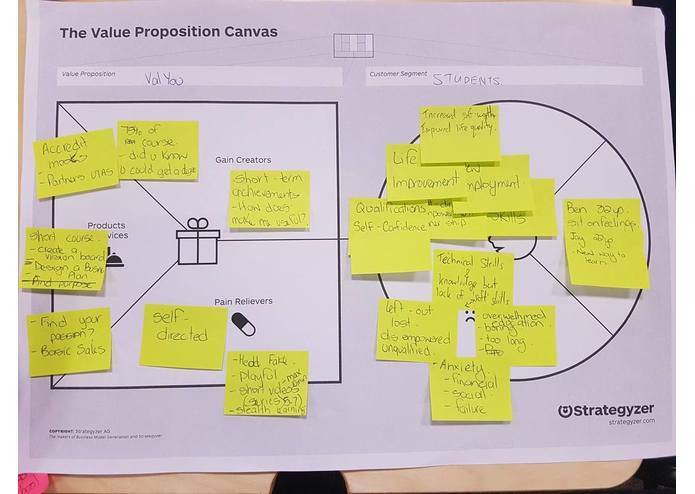 In doing so, we eventually came up with our target market, their pain points and a solution to solve their problems. This taught us the importance of identifying your market and understanding their needs, prior to creating anything. It also improved our ability to work as a team and increased our ability to come to an agreement on what features were important as we had a fixed problem to solve. This also helped any personal biases for feature sets that were prevalent before identifying a pain point to solve. In the future, ValYou will include an inbuilt content publication platform to allow course creators to not only publish free courses but to also publish blog posts, directly communicate with students and build their own personal brand profile within the application. Furthermore, the application will have an inbuilt data analysis feature which will analysis the behavioural habits of student’s who complete micro-course. This information will then be used to automatically present suggested micro-courses, based on user behaviour (which also indicates user interest) which allows the student the gradually gain a large amount of subject relevant knowledge. This then empowers students to move onto larger courses within the application & even accredited courses, outside of the application as they have now got a sense of confidence regarding that subject area. In the future, we also plan on implementing a data based mood tracking system to allow our users to track & evaluate their moods. Through this system, we also hope to assist in mitigating suicide rates by identifying those that may be of at risk. These individuals are then given the ability to easily get in contact with suicide support services such as Lifeline and Beyond Blue. How Did We Use Data Differently? We used data differently through our micro-course educational system. 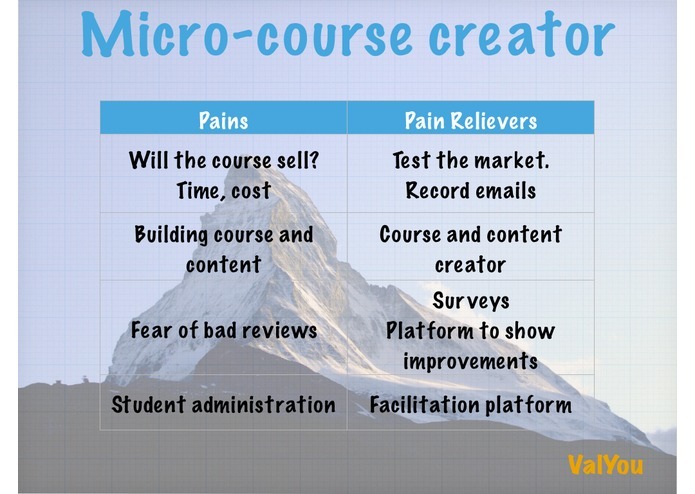 Instead of having students register for large courses, with the risk of not enjoying the content matter, we have the courses target them instead. The application will analyse the user’s course completion data to present to them potential courses based on their habits. This allows students to engage with learning, in topics they enjoy, with minimal risk or investment on their end. This data also provides course creators to target customers through topic-specific behavioural habits. Thus, improving the experience for both the student and teacher to bring the passion back to learning once again.